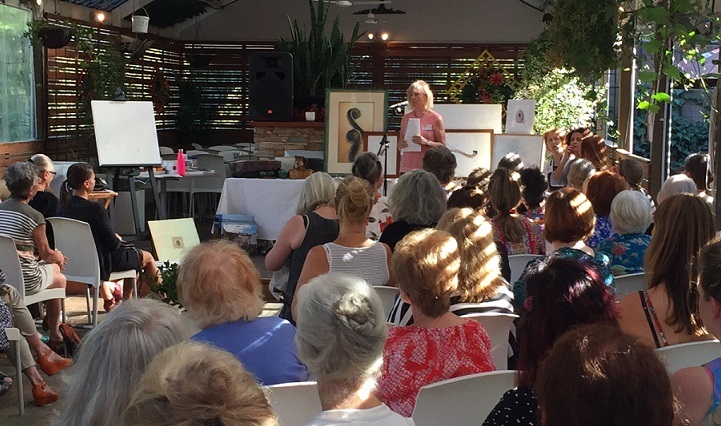 Attendees at the March 15 Artistic Morning Tea held at Warran Glen in Warrandyte, heard artist talks with an art demonstration by contemporary artist Jenny Scholes, botanical artist Janette Bird and ceramic artist Jane Annois. An international award-winning contemporary artist, Jenny Scholes is an artist, teacher and award-winning exhibitor. Jenny delighted the morning tea audience showing her early paintings and speaking about her career highlights and many achievements in a lifetime of art. Jenny demonstrated painting a contemporary Australian landscape using a variety of tools during the morning and sharing many techniques and tips - a delight to watch and much was learnt. A love of nature was evident in botanical artist Janette Bird’s artworks shown during the morning tea. Janette spoke about her life as an artist from the early days of ‘becoming’, to the balm of art during personal tragedy and the abundant inspiration found at her back door living in Doongalla Forest, in the Dandenongs. Janette balances the constraints of working on her intricate detailed fauna and botanical pieces with regular life drawing at Maroondah Federation Estate, wherein sketching, open and expressive strokes can be used encouraging hand-eye coordination and keeping her art fresh. 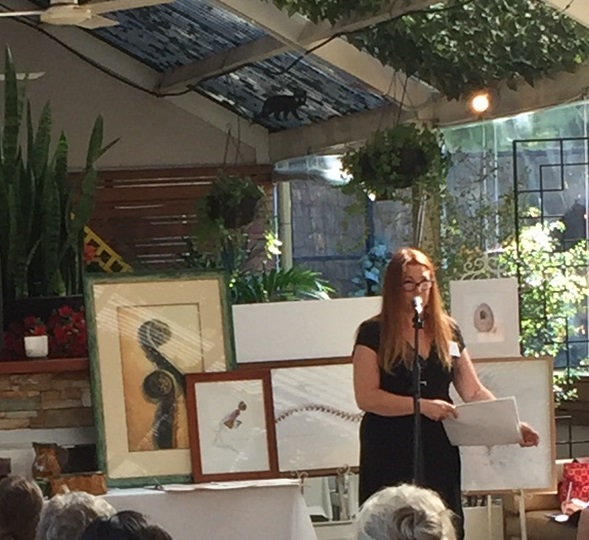 As an emerging successful artist, Janette has run solo and group exhibitions at Montsalvat and Maroondah Art Gallery, successfully obtaining an arts grant to run life drawing classes and exhibit with Studio4 artists at Maroondah Federation Estate. Ceramic artist, Pottery Expo organiser and French art tours guide, Jane Annois stunned and amazed the audience with her multi-talents. An organiser of Warrandyte's popular annual ceramics Pottery Expo by the Yarra River held each summer, Jane is also a regular overseas in Paris at many French ceramics exhibitions and sales, which are an almost everyday event in France. Jane delighted the morning tea attendees with stories of the French ceramics way of life, her tour groups with Zeste Tours in France and her art, showcasing a variety of ceramics and speaking of clay, kilns and glazes. 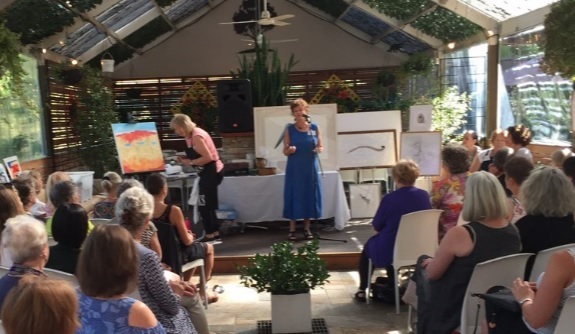 Warranwood Art Show thanks all the artists at the morning tea for their generosity of time and sharing themselves with everyone at the Artistic Morning Tea held on 15 March 2017 at Warran Glen Garden Centre & Café in Warrandyte. 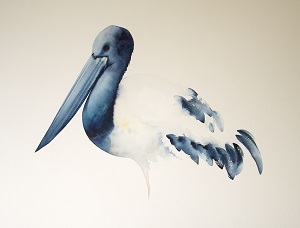 Warranwood Art Show thanks watercolour artist, Nadine Dudek who has generously donated her beautiful watercolour painting, Jabiru, for raffle at Warranwood Art Show’s April 2017 Exhibition. Warranwood Art Show events form part of its Vision to bring events to the local, arts and greater communities, that inform and demonstrate to fulfil its goal towards ‘supporting the artistic community’.